A guided bus tour can help you get round the sights of Berlin with ease! This is a city with a lot of history and guided information can realy help you understand everything that you are seeing. There are three main choices of bus tour company(CITY SIGHTSEEING, CITY CIRCLE SIGHTSEEING, TEMPELHOFER HOP ON HOP OFF BUS TOURS etc. ), and we detail these below for you. Choice really comes down to Bus Route and Price and check what they all offer and which suits you best. In our opinion, the Berlin City Sightseeing Tour offers the most comprehensive routes, supported by frequent departures, but it is also the most expensive. For a longer stay the City Circle Sightseeing tour offers a good value 3 day ticket. 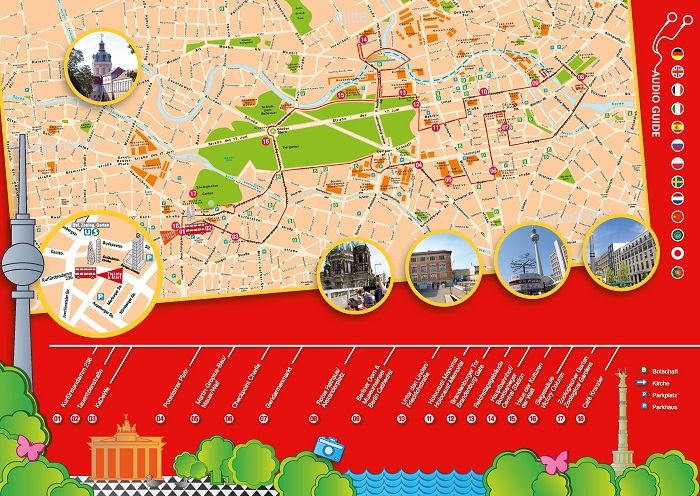 Berlin City Sightseeing Red Bus Tour offers 3 routes covering all the major attractions in Berlin. It provides live audio commentary on headphone, and also has a live guide on the bus. There are 2 complimentary walking tours which are operated from April till October. This is rated the best hop-on hop-off sightseeing bus tour in Berlin by TripAdvisor. City Circle Sightseeing has yellow coloured buses which are operated by several bus companies. It offers unlimited hop on hop off on two different routes. The tour also provides a live guide on the bus and a Berlin city map. There are special family discounts on offer. Tempelhofer Bus Tour is a part of the Berlin Pass. The buses are white in colour and offer unlimited hop on and hop off opportunity to discover Berlin at your own pace. This is a one-day, one-route ticket which offers recorded audio commentary and a live guide. Explore Berlin aboard the exciting open-top double-decker hop-on hop-off bus, and marvel at the waterside attractions on a 1-hour ride along the city’s canals. Choose between a 24-or 48-hour bus & boat tour to experience the capital city. Discover some of the most interesting places as you hop-on and off the open-top bus with panoramic windows along 20 different bus stops. Listen to audio guide commentary onboard the bus in 15 different languages. Enjoy the fully air-conditioned bus while seeing beautiful sights like the Reichstag, Charlottenburg Palace, Brandenburg Gate, Holocaust Memorial, Kurfürstendamm, Alexanderplatz square, remnants of the Berlin Wall and many more. Get off the bus and onto a boat at the Hauptbahnhof / Moltkebrücke station and cruise through the city’s canals for an hour. See the Government district and central Berlin from the boat. Travel through Germany’s capital and largest city, on an open-top doble-decker hop-on hop-off bus tour. Explore the city with a 24-hour ticket and visit some of the best places and attractions in Berlin. Explore Berlin’s most famous landmarks and attractions, the Berlin Wall, the East Side Gallery and many more. Get access/admission into the Madame Tussauds Berlin and experience the world of many celebrities with glamour and elegance. Travel along 20 different stops around Berlin and marvel at top attractions with hop-on hop-off privileges. Listen to the onboard audio commentary and learn about the city’s past in 8 different languages and enjoy wonderful discounts at many top attractions by showing your ticket. 7th November to 20th March to: 10 A.M. -2:40 P.M.
7th November to 20th March to: 10 A.M. -3:20 P.M.
Start the hop-on hop-off bus tour from the top tour sightseeing stop: Kurfürstendamm 24 Boat cruise starts from the Hauptbahnhof / Moltkebrücke stop every 30 minutes. You can start your tour from any of the stops, but to enjoy the full experience it is advisable to start from stop 1 (Kurfürstendamm). III Reich (1 hour): Starts at Brandenburger Tor. Die Mauer/ The Wall (1 hour): Starts at Mauergedenkst ÃƒÆ'a \80\ 9AÂ¤tte. Westend Tour is only operated from April to October. Dogs are allowed on the tour. Print the voucher in your mail and show it to the bus conductor. Show the mobile or printed voucher to the City Circle employee dressed in yellow at the bus stop. Show the mobile or printed voucher to the Tempelhofer Bus employee at the bus stop. You can use either a mobile tickets and paper printed vouchers to activate your hop-on hop-off & boat tour. Exchange your ticket at the Kurfürstendamm 24 stop. Hand your voucher to the driver to exchange your hop-on hop-off voucher for a bus ticket at STOP 1 or any of the stops you wish to start from. Where to Buy Berlin City Circle Yellow Bus Sightseeing Tickets? We are comparing the Best Hop On Hop Off Berlin City Sightseeing tour Prices from leading online Tours and Ticket suppliers, try to find you cheap tickets prices on the market. Where to Buy Berlin City Sigtseeing Red Bus Tour(Grayline) Tickets? Where to Buy Berlin Hop on hop off Tempelhofer Bus Tours Tickets? Explore the German capital Berlin in a comfortable and exciting City Circle Sightseeing Yellow Bus as you marvel at the stunning sights of the city. The Berlin City Circle Sightseeing Yellow Bus Tours is an open-top double-decker bus that gives you a great view of the city with its panoramic windows. Enjoy free WiFi onboard the city circle bus and a pre-recorded audio commentary about Berlin in 20 different languages via free audio headphones. The bus takes you along 2 routes with over 30 stops while you marvel at the Brandenburg Gate, Potsdamer Platz, Siegessa\A4ule, Checkpoint Charlie, Gendarmenmarkt, Alexanderplatz, and many other attractions just to name a few. Hop-off at any stop and experience the German capital in your own style and rhythm with a choice of the 1- or 2-day ticket. Your children will enjoy the children's channel audio guide in both English and German languages. Hop-off the bus for a walking tour and explore Berlin's famous sights, attractions, and neighborhoods. This ticket gives you discounts at some selected restaurants, shops, shows, attractions and leisure activities in Berlin. How much is a 1/2/3 day Berlin City Circle Sightseeing Bus Tour? All children under 6 years ride the Berlin City Circle Sightseeing Yellow Bus for free. Bus stops: Alexanderplatz, Hackesche Ha\B6fe, Central Train Station, Berlin Wall Memorial, Mauerpark, Kollwitzkiez / Prenzlauer Berg, Karl-Marx-Allee, Simon-Dach-StraÃŸe, East-Side-Gallery, East Central Station, Oranienplatz/Kreuzberg, and Jewish Museum. TripAdvisor: with the average rate of 5.0 by its former users, the Berlin City Circle Sightseeing Yellow Bus Tour service ranks very well. The number of dissatisfied travelers is far below those that are very satisfied. The overall number of reviews is 195 and 60% of participating tourists rated the bus tour as excellent. While 13% gave it a very good rate. Viator: Those who bought the Berlin City Circle Sightseeing Yellow Bus Tour tickets on this website gave it a 4.5 rate based on past experience. This is a very impressive review with 38 reviewers. Get Your Guide: Most people who got their tickets for the Berlin City Circle Sightseeing Yellow Bus Tour tickets through this website rated it a 4.2 (1,132 reviewers) rate. This is the most impressive review for this tour bus service. The Berlin City Circle Sightseeing Yellow Bus Tour service offers tourists an exclusive tour of the German capital Berlin. Tourists enjoy the convenient double-decker open-top bus while seeing sights in Berlin and listening to audio commentary in 20 different languages. You get free WiFi access onboard to share your adventures online, you can hop-on and off at any of the stops to get a closer view of the Berlin's top attractions and monuments with a map in hand so you don't miss any attraction. The Berlin City Circle Sightseeing Yellow Bus Tour takes you across two routes and over 30 stops with all the major landmarks and attractions of the capital city with either a 1 or 2-day ticket. You get to admire beautiful sights like Brandenburg Gate, Potsdamer Platz, Siegessa\A4ule, Checkpoint Charlie, Gendarmenmarkt, and Alexanderplatz just to name a few. Is the City Circle Hop on hop off Yellow Bus Tour Right for Me? With the Berlin City Circle Sightseeing Yellow Bus Tour, you get access to free Wi-Fi and headphones to listen to the audio guide onboard the bus. You get a map to help you navigate Berlin on foot whenever you hop-off the bus for a stroll on your own. You can hop on at the next stop or terminate your tour, visit landmarks, museums, monuments and other major attractions such as Checkpoint Charlie, Gendarmenmarkt, and Alexanderplatz or take pictures at the Brandenburg Gate, Potsdamer Platz, and Siegessa\A4ule. This is the right way to tour Berlin, Germany's capital city. Explore Berlin's major interest points on a double-decker open-top bus. Admire Germany's capital along 2 different route choices and marvel at the Brandenburg Gate, Alexanderplatz, and Checkpoint Charlie. With just a 24-hour ticket, you get to see the city's most admirable sights onboard the iconic Berlin City Sightseeing Hop-On-Hop-Off Bus Tour. See the Berlin Wall Memorial and choose between four top attractions such as Berlin Aquadom, Dungeon, Sealife, LEGOLAND Discovery Centre, or Madame Tussauds and explore. Onboard the bus, you get to experience the beauty of the city along the 25 stops with audio commentary in 9 different languages and also the ability to hop-off at any stop that interests you for a closer look at the landmarks and monuments. Enjoy discounts at over 15 top attractions with your ticket. Choose between the Berlin Aquadom, Dungeon, Sealife, LEGOLAND Discovery Centre, or Madame Tussauds and explore at your own pace. Hop-off the bus and explore on foot with a Berlin Information booklet, a Map guide and local offers in hand showing all top attractions. You get to enjoy a free Berlin walking tour "III. Reich" which operates only from April to October. This ticket gives you discounts at some 15 top attractions in Berlin. How much is a 1/2/3 day Berlin Hop-on Hop-off Bus Tours? Berlin Dungeon: Children under the age of 8 are permitted to enter the Berlin Dungeons. But children under 15 years must be with an adult. LEGOLAND Discovery Centre Berlin:All adults must be accompanied by at least 1 child to visit this attraction. AquaDom & SEA LIFE Berlin: Children under 15 years of age must be accompanied by an adult. Madame Tussauds Berlin: Children under 15 years of age must be accompanied by an adult. We are comparing the Best Hop On Hop Off Berlin City Sigtseeing Red Bus Tour (Gray line) Prices from leading online Tours and Ticket suppliers, try to find you cheap tickets prices on the market. Bus stops: Tauentzienstrasse, KaDeWe, Potsdamer Platz, The Wall/Martin-Gropius-Bau, Checkpoint Charlie, Gendarmenmarkt, Park Inn Hotel, Alexanderplatz, Rotes Rathaus/Neptune Fountain, Lustgarten/Museumsinsel, Brandenburger Tor/"Platz des Ma\A4rz", Hauptbahnhof/Ella-Trebe-Str, and Siegessaule. Bus stops: Rotes Rathaus / Neptunbrunnen, Oranienburger StraÃŸe/ Neue Synagoge, Hauptbahnhof, Berlin Wall Memorial/AckerstraÃŸe, Bunker Gesundbrunnen, Mauerpark, Scha\ B6nhauser Allee/Schwedter StraÃŸe, Alexanderplatz (Park Inn Hotel), Karl-Marx-Allee (Computerspielmusem), East Side Gallery, Ostbahnhof, and Alexanderplatz. TripAdvisor: with the average rate of 3.5 by its former users, the Berlin City Sightseeing Hop-on Hop-off Bus Tour service ranks very well. The number of dissatisfied travelers is far below those that are very satisfied. The overall number of reviews is 1,187 and 33% of participating tourists rated the bus tour as excellent. While 30% gave it a very good rate. 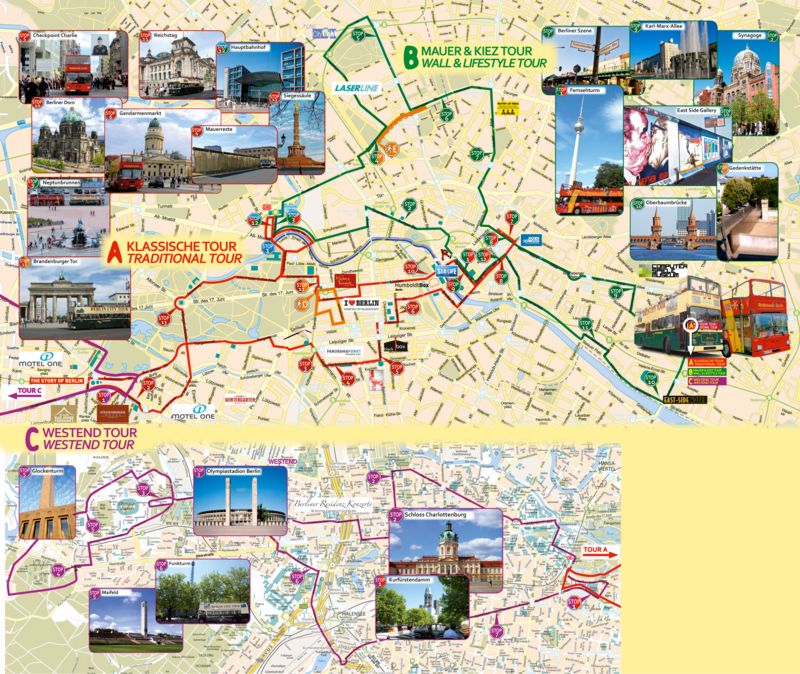 Get Your Guide: Most people who got their tickets for the Berlin City Sightseeing Hop-on Hop-off Bus Tour through this website rated it a 4.3 (658 reviewers) rate. The Berlin City Sightseeing Hop-on Hop-off Bus Tour offers a great way for tourists to discover the German capital. Once you hop-on the open-top double-decker city sightseeing bus, you get access to a whole lot of things such as free headphones to catch up with the history of the city through the onboard audio commentary in 9 different languages and a live tour guide in English and German. This tour bus has a 360-degree view which gives you a panorama of Berlin and also you get an information booklet, a map to guide you whenever you feel like hopping off the tour bus at any of the 25 stops for a stroll. You get to visit places like the Berlin Wall Memorial, the Brandenburg Gate, and Checkpoint Charlie just to name a few. With 2 routes (Traditional and Wall & Lifestyle), you get the choice to pick from 4 top attractions to visit which are Berlin Aquadom, Dungeon, Sealife, LEGOLAND Discovery Centre, or Madame Tussauds. This tour gives you an in-depth overview of Berlin with just a 24-hour ticket. 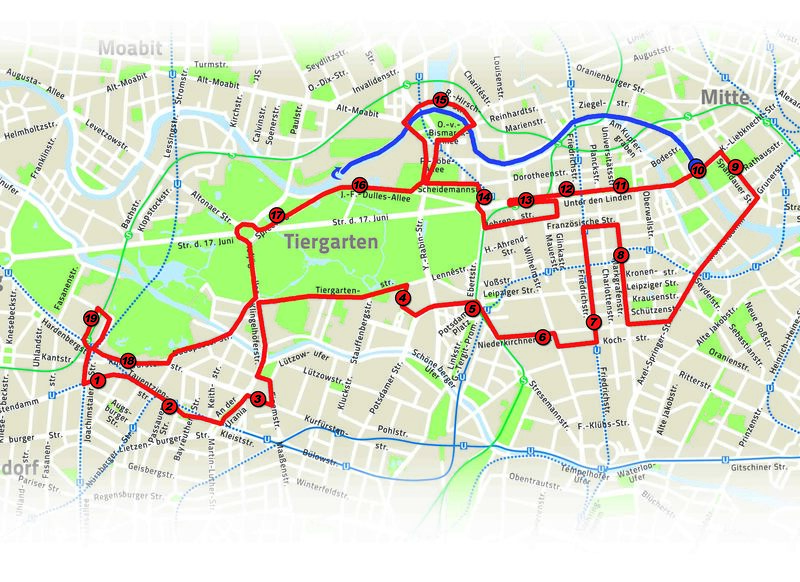 Is the Berlin Hop-on hop-off Red bus tour Right for Me? This Berlin City Sightseeing Hop-on Hop-off Bus Tour is right for people who want to have fun and still get value for their money. With the onboard audio commentary in 9 different languages and a live guide in English and German, it informs tourists about the history and major attractions in Berlin. This tour bus offers many discounts at 15 top attractions in the city, with a complimentary walking tour and is also family friendly. Children get to enjoy LEGOLAND Discover Center or Madame Tussauds if selected while booking or visit the Berlin Dungeon, Sealife, Berlin Aquadom. Marvel at the monuments and landmarks in the city with family or friends. The Berlin Tempelhofer Bus Tour is an exciting and exclusive way to get a feel for Germany's capital. The white coloured, double-decker bus offers tourists an unlimited opportunity to hop on and hop off the bus to explore Berlin in style in their own convenient time. With a 24-hour ticket, enjoy a single-route with 19 stops, see all the excitement this city has to offer which covers all the main attractions, landmarks, and monuments in the Berlin. Enjoy audio commentary in English and German including a live guide on the bus. Marvel at KaDeWe one of the largest shopping centers Europe. Hop-off the bus to explore Berlin museum on foot. This ticket gives you discounts at some selected attractions and leisure activities in Berlin. How much is a 1/2/3 day Berlin Hop on Hop off Tempelhofer Bus Tours? All children under 5 years ride the Berlin Tempelhofer Bus Tour for free. We are comparing the Best Hop On Hop Off Berlin Tempelhofer Bus Tours Prices from leading online Tours and Ticket suppliers, try to find you cheap tickets prices on the market. Bus stops: Kurfurstendamm 231 (in front of Karstadt), KaDeWe (main entrance), Lutzowplatz (opposite Hotel Berlin), Philharmonic / Kulturforum, Potsdamer Platz (at Kolhoff-Tower), Topography of Terror, Checkpoint Charlie (at the Checkpoint Charlie Museum), Gendarmenmarkt, Markgrafen- / TaubenstraÃŸe, Alexanderplatz, Red City Hall, Neptunbrunnen, Radisson Hotel (to the boat), Humboldt University / Bebelplatz, Unter den Linden 36 / FriedrichstraÃŸe, Unter den Linden 74, Madame Tussauds Berlin, Brandenburg Gate, EbertstraÃŸe, Hauptbahnhof, exit Rahel-Hirsch-StraÃŸe, Haus der Kulturen der Welt, Bellevue Palace / Siegessa\A4ule / Tiergarten, Bikini Haus, Budapester StraÃŸe, and U-/S-Bahn station Zoologischer Garten. The Berlin Tempelhofer Bus Tour is a well packed and concise for tourists to get around Berlin within a 24-hour period. This bus ticket allows you to see all the top attractions around the city while on the double-decker bus with a live guide onboard in English and German. You get to see places like the Kurfurstendamm, Potsdamer Platz, Checkpoint Charlie, Gendarmenmarkt, Alexanderplatz, Museum Island, Berlin Cathedral and Humboldt University. You also get to admire Brandenburg Gate, Unter den Linden, the Government District, Holocaust Memorial, and Berlin Central Station, KaDeWe, and many more just to name a few. You can hop off at any of the 19 stops and continue your tour by walking around the city on foot. The Berlin Tempelhofer Bus Tour also gets you discounts at most of the top attractions and museums. Is the Berlin Tempelhofer Bus tours Right for Me? Given that this Berlin Tempelhofer Bus Tour has a single route, you still get to see the major highlights of the city with a live guide in English and German on the tour bus. The 24-hour ticket is all need to enjoy this awesome adventure and see the Brandenburg Gate, Unter den Linden, the Government District, Holocaust Memorial, and Berlin Central Station just to name a few. With the ticket, you get discounts at select top attractions along the 19 stops which also has KaDeWe one of the largest shopping centers in Europe. It's surely a nice way to explore and admire Berlin at your own leisure. Get a combined hop-on-hop-off bus and boat ride tour ticket to experience the fun side of Berlin. Choose between a 24- or 48-hour bus & boat ticket and hop aboard the open-top double-decker bus tour to see amazing sites and attractions like the Reichstag, Charlottenburg Palace, Brandenburg Gate, Holocaust Memorial, Kurfurstendamm, Alexanderplatz square, remnants of the Berlin Wall and many more. See the city through the hop-on-hop-off bus' panoramic windows with an air-conditioned lower deck and listen to the audio guide in 15 languages as you ride past the 20 different stops around Berlin. Get on a boat after the bus tour at the Hauptbahnhof/Moltkebrucke station and see the other side of the city with the 1-hour canal tour. Marvel at the city centre and see the Government district areas all on the Spree River Cruise. There are no complimentary tours included in the Berlin Hop-on Hop-off & Boat Ride. There are no discounts included in the Berlin Hop-on Hop-off & Boat Ride. How much is a 1/2 Day Berlin Hop-on Hop-off & Boat Ride? We are comparing the Best Berlin Hop-on Hop-off & Boat Ride Tours Prices from leading online Tours and Ticket suppliers, try to find you cheap tickets prices on the market. Top Attractions include: U Kurfurstendamm / Kranzler: Café Kranzler, Kurfurstendamm: Gedachtniskirche, KaDeWe / Wittenbergplatz, Lutzowplatz, Kulturforum: Gemaldegalerie, Berliner Philharmonie, Kunstgewerbemuseum (Museum of Decorative Arts), St. Matthaus-Kirche,Potsdamer Platz: Sony Center, Berlin State Library, Transfer to PanoramaPunkt; Martin-Gropius-Bau: Abgeordnetenhaus of Berlin, Bundesrat; Checkpoint Charlie: Museum Haus at Checkpoint Charlie,Gendarmenmarkt, Bebelplatz / Berlin State Opera, Rotes Rathaus / TV Tower / Alex: Kathe Kollwitz Museum, Karl-Liebknecht-Str. : Sealife, Berlin Cathedral / Lustgarten: Altes Museum, Unter den Linden / University: Berlin State Library, Unter den Linden / Friedrichstr, Holocaust Memorial, Brandenburg Gate, Reichstag / Tiergarten, Hauptbahnhof (Central Train Station) and Bellevue Palace. Boat cruise starts from the Hauptbahnhof/Moltkebrucke stop. The Berlin Hop-on Hop-off & Boat Ride ride has a lot of exciting activities for tourists. With a 1- or 2-day ticket, tourists can see amazing attractions and landmarks around the German capital onboard the open-top double-decker bus tour which runs along 20 different stops around Berlin. The onboard audio guide in 15 languages with free headphones ensures smooth learning about the attractions, the city and also share amazing moments on social media using the free Wi-Fi available on the bus. Get on and off the bus to see top attractions up close and personal such as the Reichstag, Charlottenburg Palace, Brandenburg Gate, Holocaust Memorial, Kurfurstendamm, Alexanderplatz square, remnants of the Berlin Wall and many more. At the 19th Stop, Hauptbahnhof (Central Train Station). Tourists will get on a boat and tour the city along the River Spree, where they will see the amazing Government District and central Berlin from the water. Is the Berlin Hop-on Hop-off & Boat Ride right for me? Yes! The Berlin Hop-on Hop-off & Boat ride is the perfect tour for anyone who is planning to visit the capital of Germany. It offers a lot, with the opportunity for you to get on an open-top double-decker bus to excite yourself with the view of the city's top attraction through panoramic windows. You get free headphones to listen to the audio guide on the bus in 15 languages of your choice and you can also share memorable pictures on social media using the free Wi-Fi provided onboard. Buses are wheelchair accessible, meaning even if you are physically challenged, you still do not get to miss a thing from this tour. You can hop on and off the bus at any time you wish at any of the 20 stops to explore on foot. Some of the attractions to see includes Berliner Philharmonie, Kunstgewerbemuseum (Museum of Decorative Arts), St. Matthaus-Kirche,Potsdamer Platz Sony Center, Berlin State Library, Bundesrat; Museum Haus at Checkpoint Charlie,Gendarmenmarkt, Berlin State Opera, TV Tower, Kathe Kollwitz Museum, Sealife Berlin, the Berlin Cathedral and many other attractions. So choose between a 24-hour or 48-hour ticket to enjoy this hop-on-hop-off bus tour with a boat ride along the River Spree and you will see Berlin from a different perspective. Ride around Berlin on a hop-on-hop-off bus and experience the largest city in Germany with style. Get a 24-hour ticket and travel along 20 different stops and see many major attractions in the city. The open-top double-decker hop-on-hop-off bus adapts to the seasons as you enjoy the weather in Berlin any time of the year. Listen to the onboard audio guide in 8 languages and live commentary in German and English. Feel the sun in the summer on the open-top bus, and enjoy the warmth and stay cosy during winter. Get on and off the bus to explore on foot as you see top attractions such as the remaining and longest stand Berlin Wall, Checkpoint Charlie, Haus der Kulturen der Welt (House of the World's Cultures), Computer Games Museum Berlin, Olympic Stadium and many other great landmarks. Enjoy access into Madame Tussauds Berlin and interact with life-sized figures of great popular celebrities like Cristiano Ronaldo, Julia Roberts; and others like Barack Obama, Angela Merkel and those who helped shape the countries history through the carefully selected real-life wax art exhibition at the museum. See places like Checkpoint Charlie, the Berlin Wall, Charlottenburg Palace and many more. The Berlin Hop-on Hop-off & Madame-Tussauds ticket offers discounts at 15 top attractions. Just show your ticket and you’ll get your discount. How much is a 1/2 Day Berlin Hop on hop off & Madame-Tussauds? NOTE: Children from 0-5 years ride the Berlin Hop On Hop Off Bus Tour for free and must be in the company of adults. We are comparing the Best Berlin Hop on hop off & Madame-Tussauds Tours Prices from leading online Tours and Ticket suppliers, try to find you cheap tickets prices on the market. Top Attractions include:Kurfürstendamm 231 (in front of Karstadt), KaDeWe, main entrance, Lützowplatz (opposite Hotel Berlin), Philharmonie / Kulturforum, Potsdamer Platz, at the Kollhoff Tower, Potsdamer Platz / Linkstraße, Topography of Terror, Checkpoint Charlie, at the Mauermuseum, Gendarmenmarkt, Markgrafenstraße / Taubenstraße, Alexanderplatz, Rotes Rathaus, Neptunbrunnen, Karl-Liebknecht Str. 5, (at the boat), Museum Island, Humboldt University / Bebelplatz, Unter den Linden 36 / Friedrichstraße, Unter den Linden 74, Madame Tussauds Berlin, Brandenburg Gate, Ebertstraße, Reichstag, Scheidemannstr, Berlin central station, exit Rahel-Hirsch-Straße, Haus der Kulturen der Welt (House of the World's Cultures), Bellevue Palace / Victory Column / Tiergarten, Bikini Mall, BudapesterStraße, Zoologischer Garten train station. Boat cruise starts from the Hauptbahnhof/Moltkebrücke stop. With the 24-hour Berlin Hop-on Hop-off bus & Madame Tussauds pass, tourists get to experience a whole new perspective of the German capital city. The pass offers hop-on hop-off privileges to tourists along the 20 well-placed stops around top attractions/landmarks in Berlin which they can jump off the bus to get u close and personal with attractions or landmarks. Aboard the open-top double-decker bus, tourists get a 360-degree view of the city while taking photos and enjoying the prerecorded audio guide in 8 different languages. Buses are wheelchair accessible for the physically disabled, so its not a limitation for the physically challenged. After the bus tour, the pass grants tourists admission into the Madame Tussauds Berlin to see the life-sized and life-like wax of famous celebrities, world leaders and German history makers. Some of the attractions to see include the remaining and longest stand Berlin Wall, Olympic Stadium, Checkpoint Charlie Museum, Computer Games Museum Berlin, Haus der Kulturen der Welt (House of the World's Cultures), and many more. Is the Berlin Hop on hop off & Madame-Tussauds right for me? Yes, this tour is right for you! The Berlin Hop on hop off & Madame-Tussauds pass gives you access into the best top attractions in the city. You get a hop-on-hop-off bus ride around 20 stops with all the excitements in Berlin. The open-top double-decker bus is wheelchair accessible for the physically challenged. With panoramic windows, you never miss an attraction while listening to the onboard recorded audio commentary in 8 languages. You get to see top attractions like the Charlottenburg Palace, ICC and Radio Tower, Olympic Stadium, Olympic Bell Tower, Berlin Wall Memorial, Prenzlauer Berg, East Side Gallery, Berlin Wall, New Synagogue, Computer Games Museum Berlin, Checkpoint Charlie, Berlin TV Tower, Potsdamer Platz, Concert Hall, Berlin Victory Column an many more. You can get off the bus from one stop explore on foot and hop back on at the next stop and with this pass, you also get access to Madame Tussauds Berlin. Where you'll see life-sized wax art of top celebrities, world leaders, soccer stars, and more with the eminent resemblance. This is truly a fun way to see the largest city in Germany!